Getting into the kitchen and doing a little baking doesn't have to be hard. 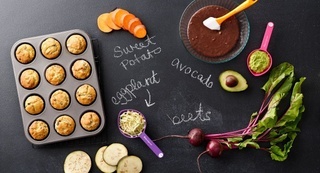 And with a little imagination, you can create everything from delightfully quick breakfast ideas to fancy desserts! As part of our ongoing series of recipes by a group of talented food bloggers using Baker’s Secret bakeware products, we asked them to create mouth-watering recipes that will challenge your self-restraint! Cakes, cupcakes, edible centrepieces and a beautiful gateaux are all within your grasp. Check out the recipes below and enjoy! And for even more inspiration, be sure to check out recipes for dreamy and decadent desserts, cookies/muffins, fill your dessert table or the chocolate lover in all of us. 5 delicious ideas to get baking with! One recipe, one muffin pan - endless options!